AppSatori: See who's using Google Apps! If you are a company doing Google Apps business the information who actually uses them is very valuable for you. There are several ways how to find it out. You can for example follow the #gonegoogle hashtag on Twitter, check the map provided by Google or the official list of the companies but there are too much or contrary too few information. What you usually need is to find out if the particular company uses Google Apps. This could be difficult but now we offer you a simple web service Google Apps Finder which does the hard work for you. Google Apps Finder comes to you in two forms. You can use it's web interface or you can install it as a chrome extension. Using web interface you can check any domain you want. You can also see the latest discovered domains. 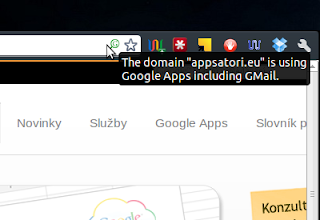 The chrome extension shows green or red magnifier icon in address bar each time the domain you are currently browsing on uses or might use Google Apps. If the icon is green it is certain that the domain uses Google Apps including gmail (email services). 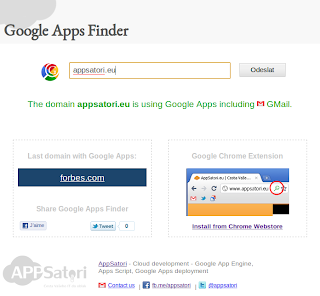 Red icon indicates that Google Apps is present on a domain but email is not activated. So it may be that someone was just playing with Google Apps for a while or it is used just for documents or so. Wish you happy Google Apps Finding!